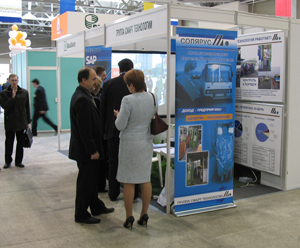 About 30 organisations from Nizhni Novgorod, the Nizhniy Novgorod area and Moscow took part in a business exhibition program from 25-27 April, 2007. The exhibition program consisted of a set of specialized exhibitions/conferences presented by sections of the information technologies and systems, communications, and finance, accounting and audit industries.ng. Within the framework of “Management Organization — 2007”, the 6th Inter-regional scientific-practical conference “New information technologies — the tool of increased management efficiency” took place. Participants gave special attention to the formation of electronic government which, according to the organizers of the conference, can be a tool of administrative reform and to achieve transparency of the activities of regional and municipal authorities. The Smart Technologies Group, by means of an operating stand, demonstrated their proprietary Automated Fare Collection System (AFCS) in ground transport. The electronic account of passenger journeys by category is an important element of public transport management because it addresses concessional privileges.